While a lot of my Ebay purchases lately have been going toward my 2011-12 Dominion collection, every now and then, I find a card that I just HAVE to have. 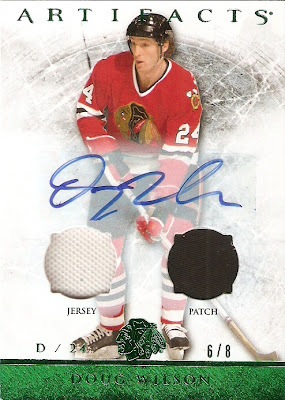 I came across a card from 2011-12 Panini Prime that featured on-card autographs of two of my favorite all-time players and one of the greatest father/son combinations in sports history, Bobby Hull and Bret Hull. 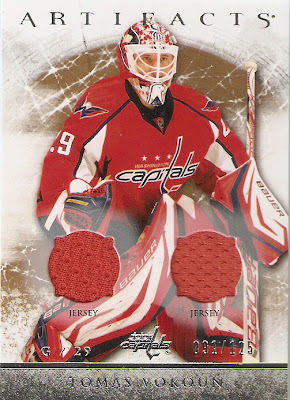 The card is numbered 5/25, and although Brett is featured in his Red Wings sweater instead of the Blues, I think it works well for them both to be wearing red. It kind of coordinates, even though they are from different teams. During the late '90s when my favorite player at the time, Mario Lemieux, had retired, I became a big Brett Hull fan. 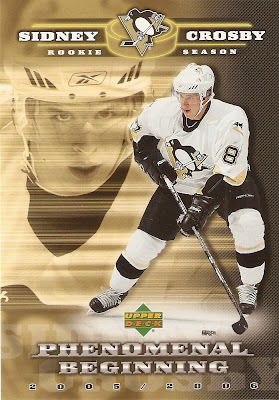 I still kept my team allegiances with Pittsburgh, but could never fully get on the Jaromir Jagr bandwagon. I was definitely a Hull guy, and living in Texas at the time, it was pretty awesome to see him help bring the Lone Star State its first (and only) Stanley Cup in 1999. While this is my first autograph of Brett Hull, it isn't my first of Bobby, not only did I pick up another auto of his a few weeks ago, I also have a jersey that I got signed by him in person. As it turns out, in the mid '90s, I already had a Hull jersey that I was wearing on a fairly regular basis, so when he came as a guest at one of Tri-Star's annual sports collectors shows in Houston, I saw my chance to get it signed and add a really cool item to my collection. Since I was too young to drive at the time, my dad took me, and told me all about Hull and other Blackhawks like Stan Mikita, Keith Magnuson, and Tony Esposito, and how they never seemed to be able to beat "those damn Canadiens" in the finals, and told me that when I get up there, to tell Hull how it broke his heart that they always kept losing to the Canadiens in the Cup finals. So, I get in line and get closer to the front, and realize that this is one big dude. Big guy, big booming voice, and I'm just a 15-year-old kid. My turn comes up next, I say hi, shake hand him the jersey, and since I'm not sure if he understands the importance of symmetry in autograph placement, and what collector's like myself look for, I ask him if he can sign his name on the middle bar of the "9," he doesn't say anything, and begins to sign his name on the TOP of the "9." I'm a little disappointed that I won't get my jersey signed quite the way I want it, but THEN, he goes to the middle of the number and inscribes his nickname, "The Golden Jet." AWESOME! It turned out even better than I thought it would. I had just a few seconds, so I shake his GIGANTIC hand, thank him for his time, and then tell him, "My dad grew up a huge Blackhawks fan, and it broke his heart how you could never beat those Canadiens." Then Hull, who looks like the kind of guy who would have no problem punching a kid, let out a laugh, shook his head, and said, "Aw, don't remind me, kid." He then thanked me for coming, and I went on my way. 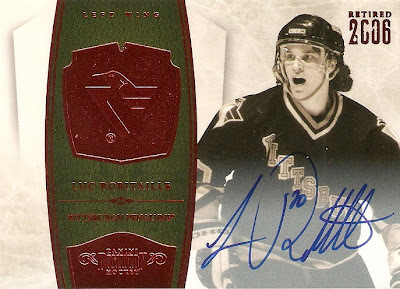 Not only do I have a great piece at the center of my hockey collection, but even more, I have a cool story to go with it. 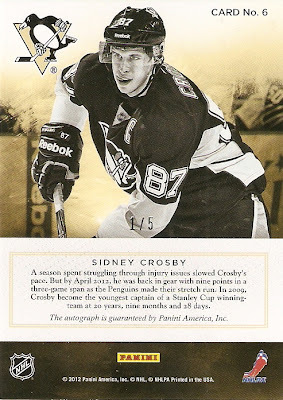 After acquiring all four autographed rookie patch cards from 2011-12 Dominion of the Pittsburgh Penguins, and really admiring the look of what Panini did with these cards, I have decided to embark of what may be an impossible task. I am going to try my best to complete the set. There are a total of 70 rookie autographed patch cards from Dominion, with 52 being numbered to 199 and 18 being numbered to 99. I am already on the way there, with these four in hand and a few more on the way. It will get tricky, though, when it comes to a couple of these. 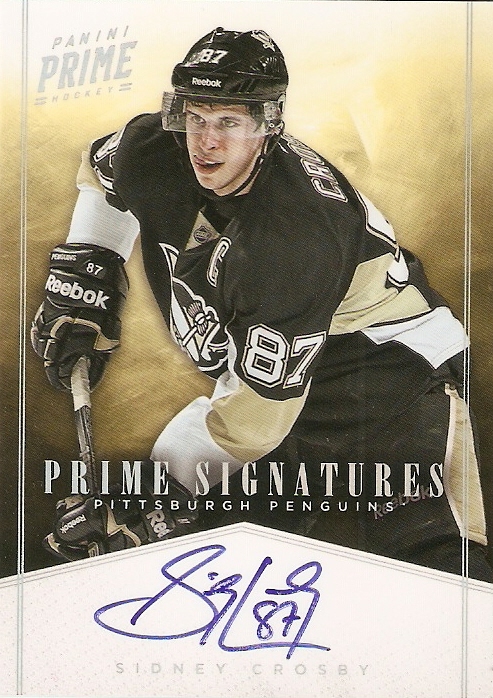 The 2011 number one pick Ryan Nugent-Hopkins has sold on Ebay for $340 at the lowest. Maybe I'll strike up a good deal down the road. The big risk with this is not just the cost that it will total, but the fact that a few of these cards, including the one for Rookie of the Year Gabriel Landeskog, are redemptions. While a lot of these redemptions are already being filled, if there are any that don't end up coming through, it would taint the set quite a bit to have a gap for one of the cards. These 70 cards range from $5 to $340, so this will be something that I'm sure I'll be working on for a LONG time, but if I can pull it off, it will be a thing of beauty. I have a link on the right side of my page, where I will be keeping track of what I am able to take in. As great as these cards look, they deserve more than a simple list. 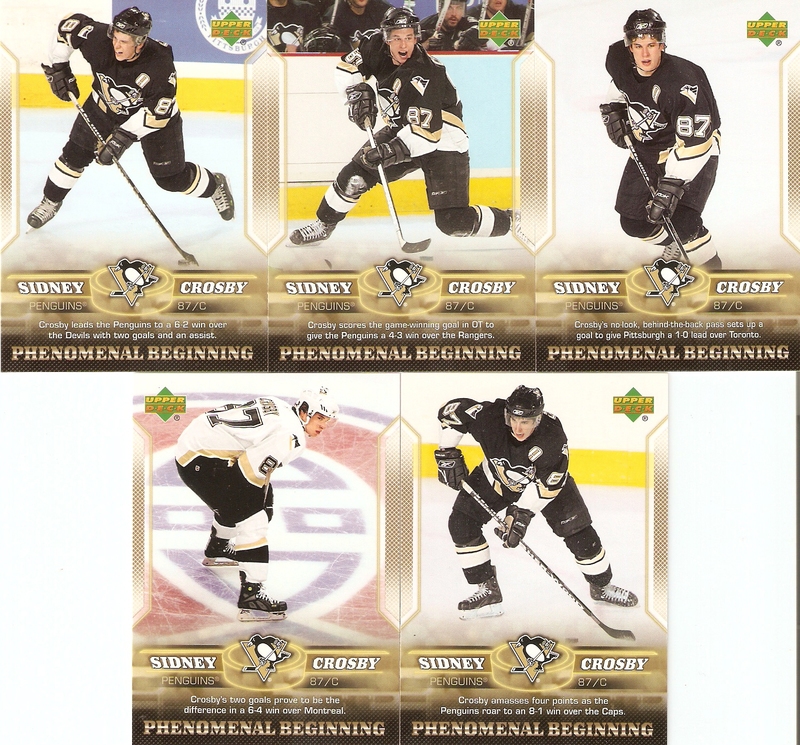 To chronicle the rookie season of Sidney Crosby, Upper Deck released a special set called "Phenomenal Beginnings" in 2006. 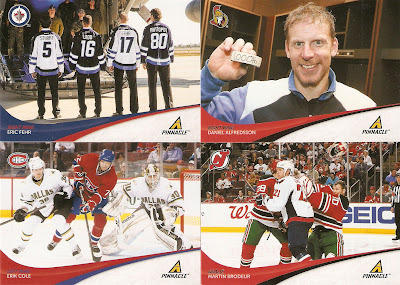 The set features 20 cards, showcasing various early milestones of his career, like first goal, first assist, draft night, and many other notable events. 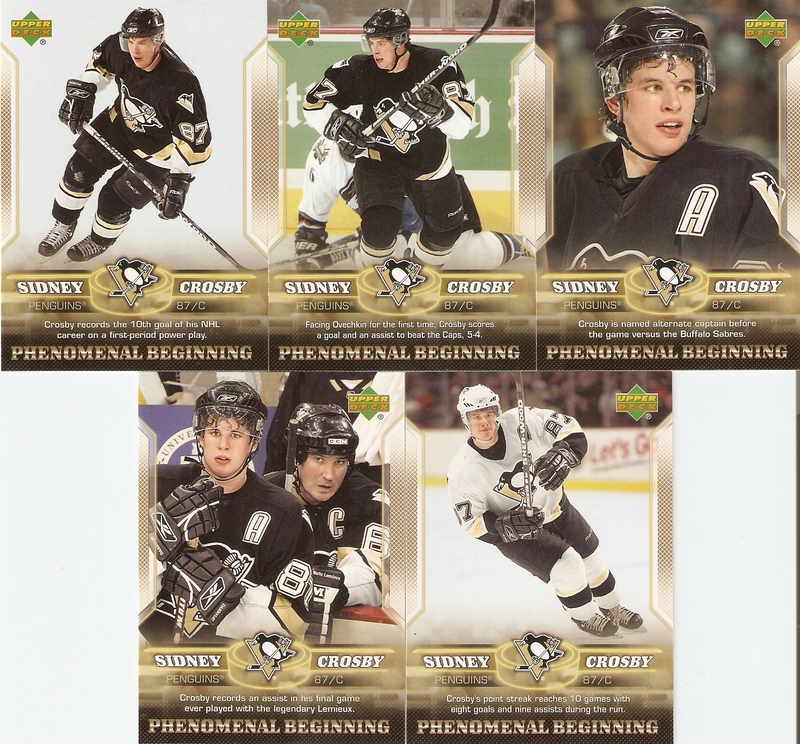 After seeing so many of these unopened boxes on Ebay for way more than I cared to pay, I finally found one at a decent price, and in the process, made some great additions to my Sidney Crosby collection (base / hits). Here's a quick look at the 20 cards and the various events they spotlight. Each box also includes a special jumbo-sized card as well. This entire box set didn't set me back much at all and provided a great new group of cards. 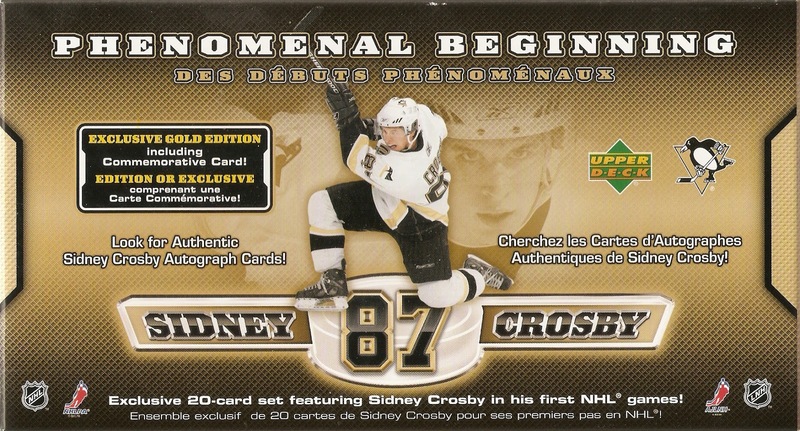 Most of Crosby's cards fetch a high dollar amount to begin with, so to get 21 cards of his for just 12 bucks is a pretty good deal, I would say. To most people, Stan Mikita is known as the namesake of Mikita'a Donut Shop in Wayne's World, I've always known him as one of the greatest hockey players of all time. Of course, my dad, who grew up in North Dakota before the North Stars came around, was a Blackhawks guy from the time he began to follow hockey, so that probably had a lot to do with it, too. With my collection of hits from retired players growing, I figured it was time a snatched up a relic of a player my dad was such a huge fan of, with a jersey card from 2011-12 Dominion, numbered 43/50. Mikita reached hockey's Mount Everest in his 1961, just his second full season, when the Blackhawks beat the Detroit Red Wings for the Stanley Cup. Mikita led the league in playoff goals that year with 6. During his career, Mikita collected quite the collection of hardware, being awarded the Hart Trophy (League MVP) in 1967 and 1968, the Art Ross Trophy (Leading Scorer) in 1964, 1965, 1967, and 1968, and the Lady Byng Trophy (Sportsmanship and Gentlemanly Conduct) in 1967 and 1968. He is also the only player in NHL history to win the Hart, Art Ross, and Lady Byng Trophies in the same season...which he did twice (1967 and 1968). 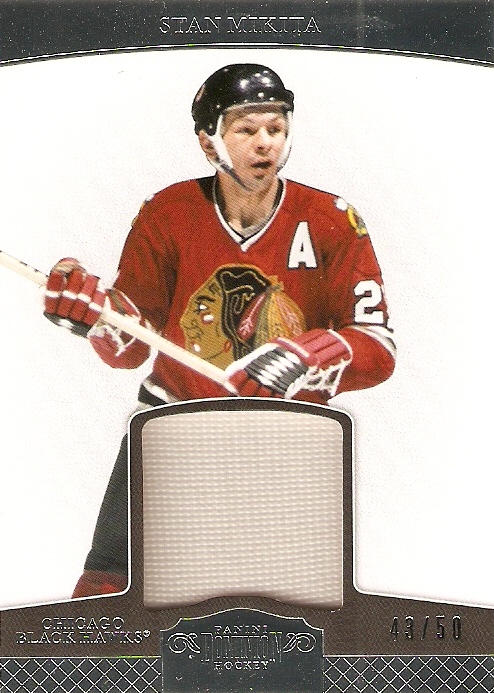 Mikita retired in 1980 and his number 21 was retired by the Blackhawks on October 19, 1980. He was elected to the Hockey Hall of Fame in 1983 and is third behind Alex Delvecchio and Steve Yzerman for longest career with a single team. 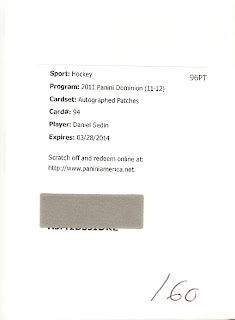 After scoring a Henrik Sedin autographed patch card /60 from 2011-12 Dominion card for a fantastic price, I decided that I needed the same card of his brother Daniel. That makes perfect sense, right? After waiting around (though, not very long) for one to pop up on ebay, I got my hands on one. Neither of the Sedin twins seems to be in any hurry to sign for Panini, as both are redemptions. Still, me being a glass-half-full kind of guy, I figure the worst-case scenario is that neither of them return their cards, and after four months, I get to request an equal-value replacement. 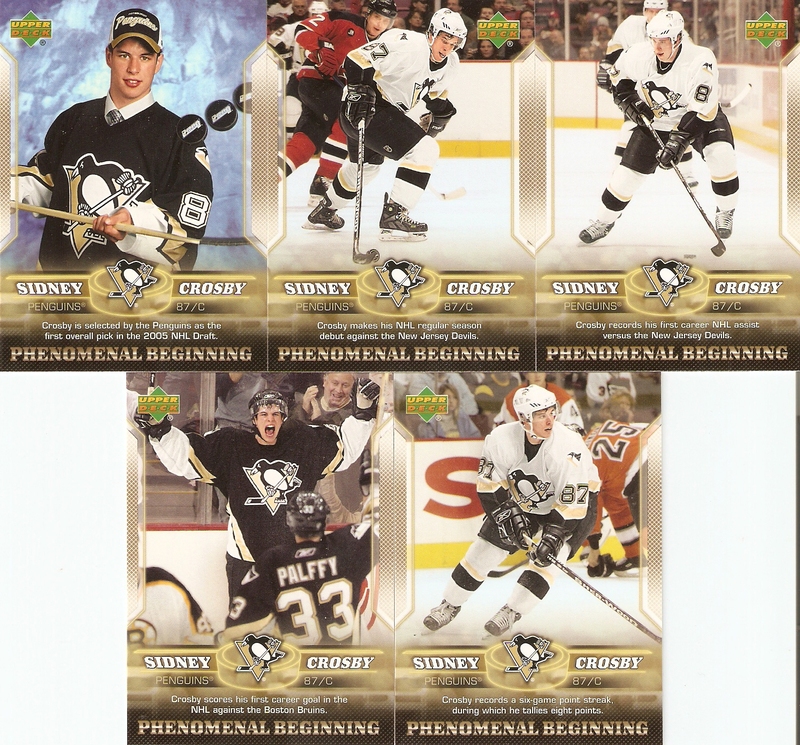 The last time I had to call Panini, they were more than happy to meet my request of replacing my redemptions with Penguins cards, so either way, things are looking good for me. I remember back in the early '90s, one of the biggest players in the hockey card market was actually a woman: Manon Rheaume. She made a big impact by becoming the first woman to play in an official NHL game, when she suited up with the Tampa Bay Lightning for an exhibition game against the St. Louis Blues in 1992, and again in 1993, for an exhibition game against the Boston Bruins. She played her first regular-season professional game in 1992, with the Atlanta Knights of the IHL. 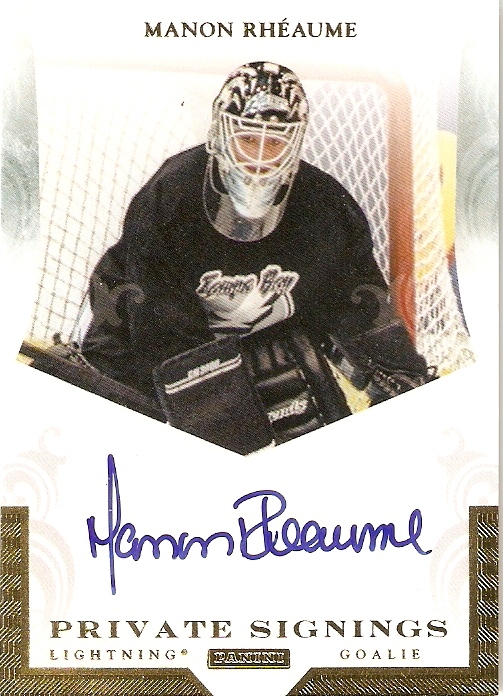 For me, though, getting my hands on an autographed card of hers is more than just a novelty. I have two young daughters, and what she represents, to me at least, is the idea, that what your gender is shouldn't hold you back from accomplishing anything. With Rheaume making he pro men's league debut 20 years ago, and Hayley Wickenheiser and Angela Ruggiero being included as playable "Legends" in NHL 13, it's good to see positive female role models from the world of puck. I know we all have players from teams outside of our favorites that we enjoy collecting. For some reason, for me, a few of those players come from the same team. I don't care either way for the Colorado Avalanche as a team, but I am a big fan of Matt Duchene, Gabriel Landeskog, and Paul Stastny. 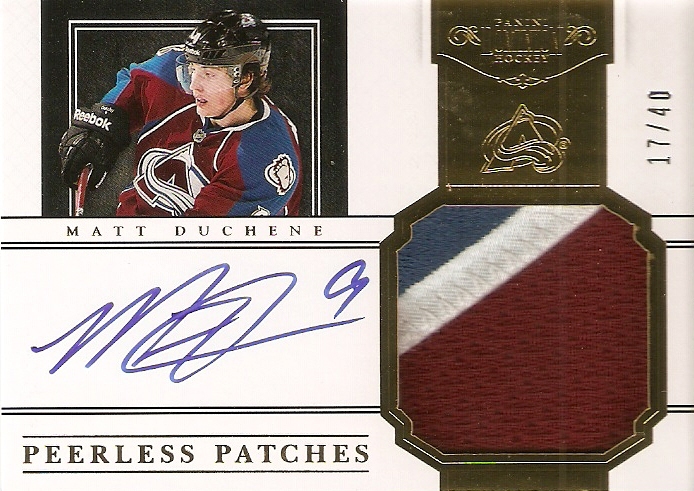 Duchene was the third overall selection in the 2009 NHL draft behind John Tavares (No. 1, Islanders) and Viktor Hedman (No. 2, Lightning). Duchene has played all three seasons after being drafted with his pro club, notching a total of 65 goals and 85 assists, with his most productive year coming in 2010-11 (27 G, 40 A). After his rookie season of 2009-10, he finished third in Calder Trophy (Rookie of the Year) voting behind winner Tyler Myers and second place Jimmy Howard. With the players currently being locked out, Duchene is temporarily playing with Frölunda HC of the Swedish Elitserien. While I have been moving more toward picking up singles from Panini Dominion, when it comes to good ol' fashioned autographed cards, I can't seem to take my eyes off of the Prime Signatures set from 2011-12 Panini Prime. I managed to pick up a few of these fantastic looking on-card autographs. Some I got at a good price, and others I had to cough up a little bit more for, but either way, these are all FANTASTIC additions to my collection. The Modano was a necessity of mine. With North Dakota roots, combined with spending most of my childhood in Texas, the last remaining link of the Minnesota North Stars/Dallas Stars connection was a no-brainer. He also has a rarity in today's hobby: a semi-legible signature. 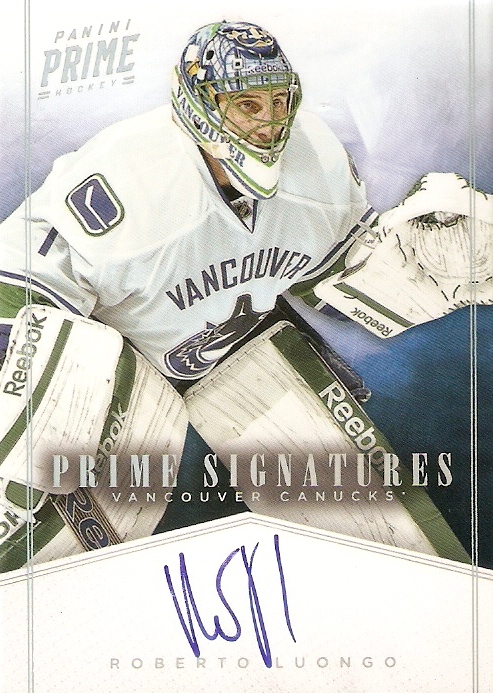 Speaking of illegible signatures, I picked up this Luongo for about 6 bucks plus shipping. He was Canada's goalie at the Olympics, almost won the Cup in 2011, and won the Williams M. Jennings Trphy (lowest goals against average) in 2011. I figured 6 bucks wasn't too bad of a deal. Despite him playing a portion of his career with the Flyers, and this card featuring him with the Flyers, I've always been a fan of his. Pronger was selected 2nd overall in 1993, but went on to FAR exceed the accomplishments of the man he was passed over for, Alexandre Daigle. 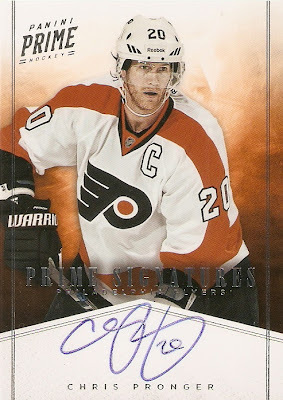 Pronger went on to have an 18-year career, in which he won the Hart Trophy (League MVP) and Norris Trophy (Best Defenseman) in 2000, Olympic gold medals in 2002 and 2010, and the Stanley Cup in 2007 with the Anaheim Ducks. Dustin Brown has yet to achieve individual superstardom,but he DID captain the Los Angeles Kings to a Stanley Cup victory in 2012. If he keeps this level of play up, he, along with teammate Jonathan Quick, should be making some MAJOR contributions for team U.S.A. in the 2014 Winter Olympics. This is a story of me selling a card, regretting that sale, and purchasing another copy of that card for a much cheaper price. Earlier this year when I was going through wax like there was no tomorrow, I was lucky enough to pull an on-card autograph of Gabriel Landeskog from 2011-12 Contenders, serial numbered to 800. Well, soon after that, Landeskog was named the Calder Award winner as Rookie of the Year, and I figured if I was going to try and get some kind of return on this, that would be the time to do it. I had it listed on Ebay with a BIN/OBO of $59.99. Soon afterward, I received an offer of $49, so I took it, thinking I did pretty good, making back half of what I spent on that box. 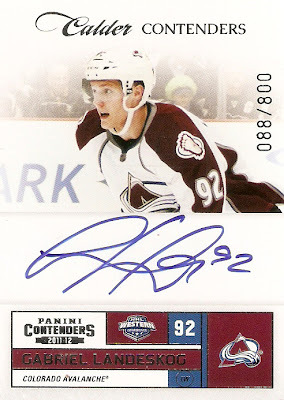 A couple months later, Landeskog was named captain of the Avalanche and I began to think that maybe I should have held onto that card. After all, for a team to commit to a young player in that way, it means that one, they think he'll be around for the long haul, and two, he's going to be relied upon to be their number one guy. I decided then that I had to get my hands on another Landeskog auto from Contenders, to right that wrong. Luckily, there are 800 of these things floating around, to the opportunity would be there.Sure enough, within a couple of days, the card was on its way to me. After selling my original one for $49 dolars, I was able to purchase this one for HALF that price. Sometimes things just work out in the end. 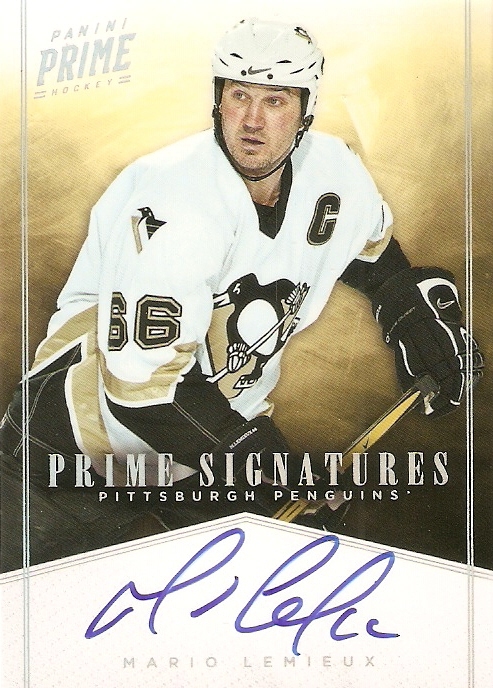 Any time I can get a Penguins autograph for a buck plus shipping, I jump at the chance, especially if it is of a retired player. I picked up this great Rick Kehoe autograph from 2010-11 Luxury Suite, numbered 154/199 for just a buck plus shipping. 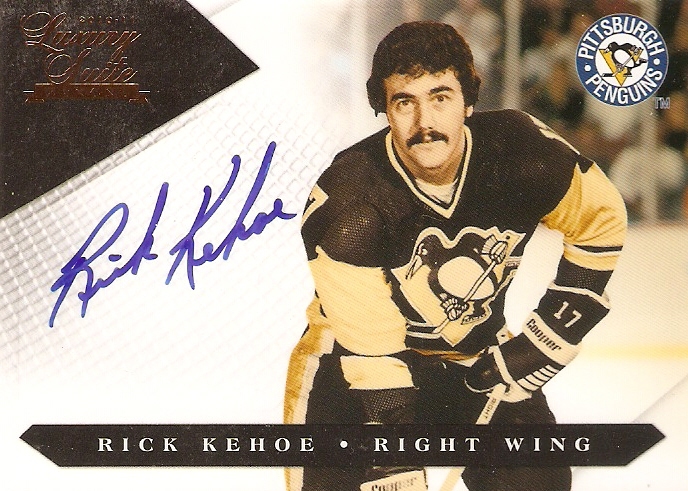 Kehoe was drafted in the second round (22nd overall) of the 1971 draft by the Toronto Maple Leafs and was traded to Pittsburgh in 1974. Kehoe was notably a very clean player, notching only 120 penalty minutes in a 14-year career and won the Lady Byng Trophy (sportsmanship and gentlemanly conduct) in 1981. That year proved to also be his most productive offensively, as he scored 55 goals and 33 assists. 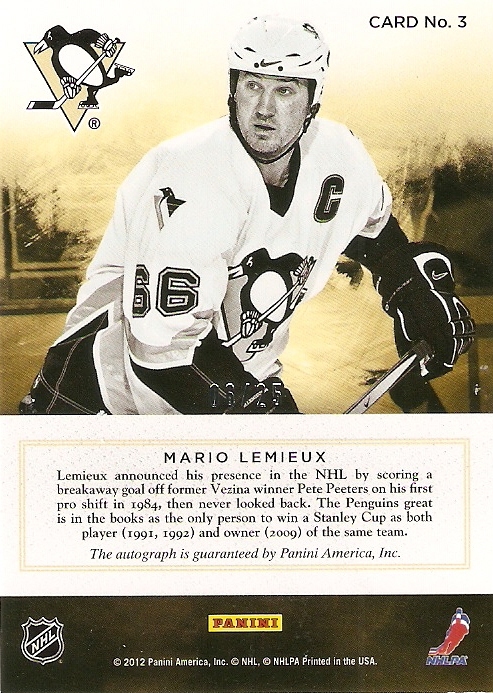 Kehoe retired in 1985 and still remains the third-leading scorer in Penguins history, behind Mario Lemieux and Jaromir Jagr. He never won the cup as a player, but finally got his name etched on Lord Stanley's Hardware in 1991 and 1992 as an assistant coach with the team. 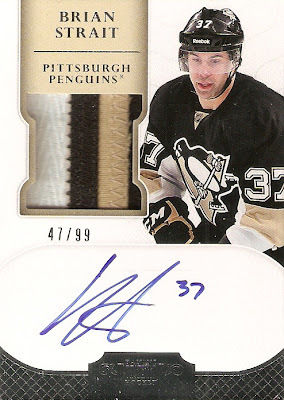 I picked up the last of four Penguins rookies from the 2011-12 Dominion rookie patch autos. 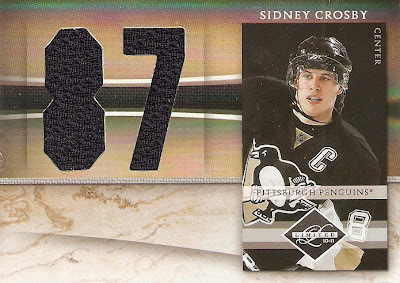 This one is serial-numbered 47/99, and features a three-colored patch at appears to come from either the jersey number or nameplate. This one, too, seems to actually match the jersey from the card photo, so bravo there. Strait was drafted by the Penguins in 2006 (3rd round, 65th overall), but didn't make his NHL debut until February 21, 2011 against the Washington Capitals. He played in three games in 2010-11 with zero points. The next season, Strait played in 9 NHL games, scoring one assist. He spent most of his time with the Penguins' AHL affiliat in Wilkes-Barre/Scranton, scoring 4 goals and 12 assists in 41 games. A little over a month ago, Douglas from Sportscards from the Dollar Store contacted me about some cards he could fill off of my want list. We agreed to a trade and a good chunk of my set needs were taken care of, which was nice. 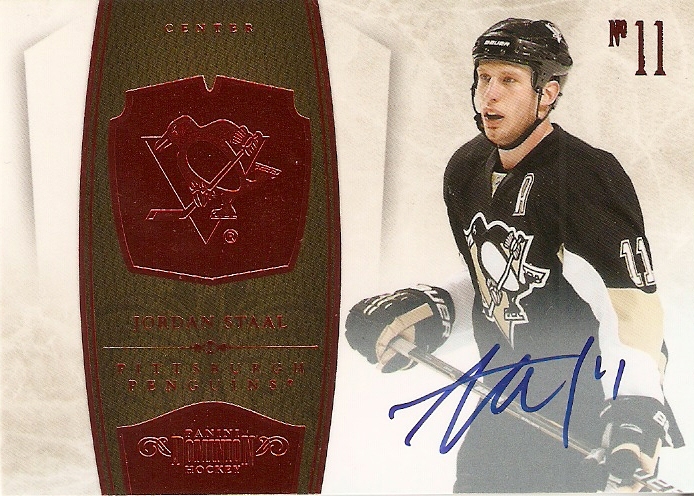 Usually, trades go more towards a hit-for-hit, so it's great to do a simple set-filler deal. Anyway, almost right as the contents of the first trade arrive in my mailbox, he shoots me another e-mail, saying that he has more cards to send my way in exchange for just a few cards off of my trade bait. Sure enough, those cards arrived in the mail today, and I have two more sets complete and am 12 cards total away from completing three more sets. My set needs for hockey are now almost bare. I may have to go through my cards and see if there are any sets that I'll need to reconsider going after. Thanks for a fantastic trade. I look forward to our next one! This card is cool in that it is the variation that features a cutout of the player's jersey number, instead of a simple circle or square. I actually got this for a pretty good deal, too, because the seller pointed out some damage to the card. If you look at the middle section on the right side of the card, you can see just a slight imperfection. Now, it's there, don't get me wrong, but such a slight ding on this card turned what would otherwise be a $20 car (w/shipping) into a purchase of $6.50 + $1.99. I'll take a ding to save myself 10 bucks. Here's a look at the second box of 12-13 Artifacts that I opened. I won't bore you with all the details about product background, hit guarantees and insertion rates. I said enough about it in my first post. I will say, though, that I was JUST as happy with the contents of this box as I was the first. The main hits for me was a Doug Wilson jersey/patch autograph numbered 6/8. I was very happy to find this card of I guy I remembered pulling cards of back when I first started collecting hockey with 90-91 Pro Set. It contains a sticker auto, but I'm not too hard on that. My one complaint, though, is with the patch. One-color solid black. Come on, Upper Deck. There are only EIGHT copies of this card, and you couldn't get me something with a secondary color? 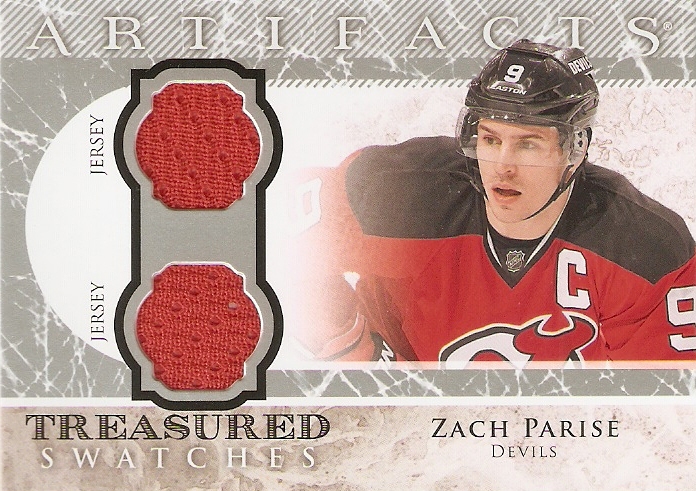 I also pulled Zach Parise dual jersey card from the Treasured Swatches insert set. One of the many bad things with the lockout is that it just makes me wait longer until I start pulling cards of Parise in his Wild uniform. By the way, in the year that I've lived up here in North Dakota, I've already met someone who went to his wedding last summer, and I am working with a guy who went to high school with his wife. 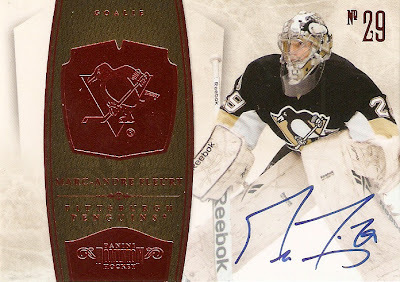 This Tomas Vokoun dual jersey card, numbered 91/125, will be a great addition to my Penguins collection, at least until they get rid of him for a different backup. There seems to be quite a rotation in Pittsburgh of number 2 goaltenders. Still, I'll enjoy it while it lasts. I know that every collector out there has a player who no matter what product they buy, they always seem to find him in the packs. For me, it seems to be the Sedin twins. Artifacts only went to prove this theory, as I found a card of BOTH Daniel and Henrik from the Tundra Tandems insert set. 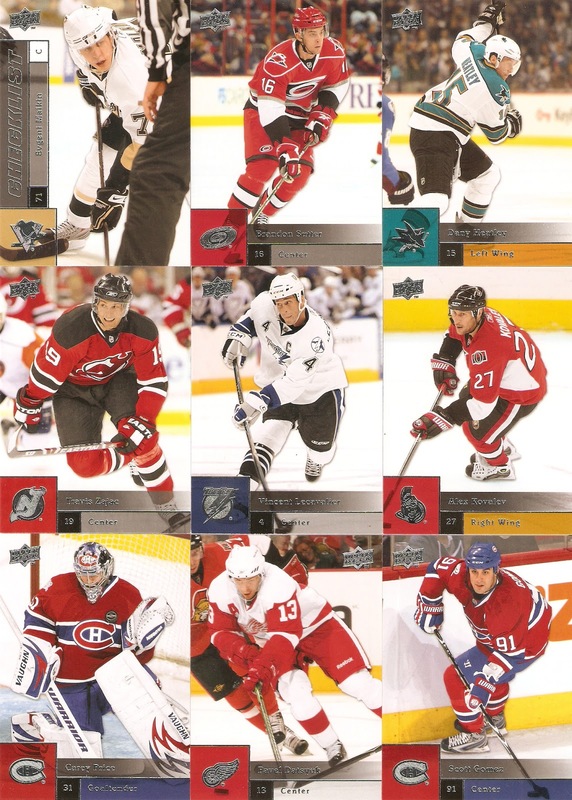 My two Team Canada serial numbered cards were of Cody Eakin 33/999 and Louis LeBlanc 763/999. 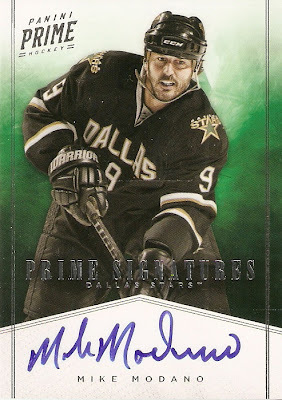 I also got a Mike Modano Sapphire 61/85 as my low-numbered parallel. My rookies were nothing special, but then again, this early in the year, not many of them are. I pulled a Jakob Silfverberg 232/999 and Matt Watkins 530/999, as well as a New York Islanders Rookie Redemption. I had scanned some base cards in this one as well. Although you've already seen what the cards look lokie, I'll show some more, just because there were so many cards of Penguins players and other guys I collect. I left this box thinking, "Man. I've had two really good boxes. What are the odds of that happening?" Then it hit me as to why. 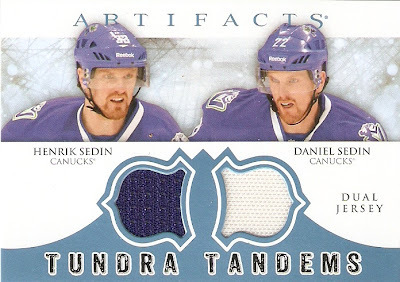 I may be in the minority here, but nothing frustrates me more than dropping good money on a box of cards, only to pull hits of three rookies and a plain jersey swatch of one of the Sedin twins. 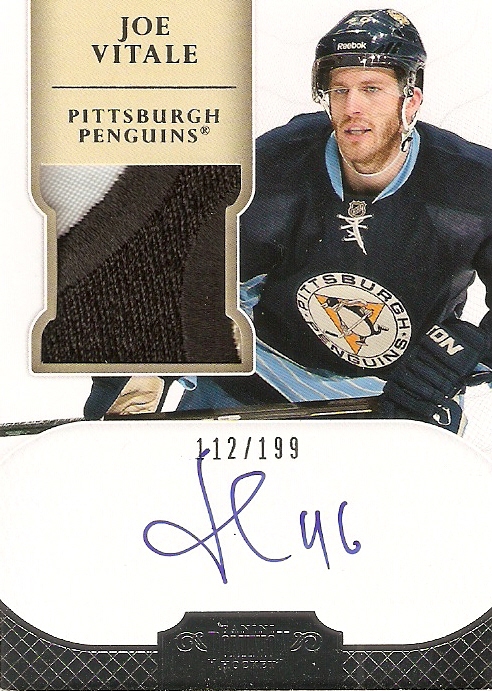 EVERY single one of my hits is of an established NHLer, and both patch cards were of retired players, which is cool. I know some people like to play the prospecting game, but for me, I want to know that the guy I havea relic card of is actually going to see some action and make some kind of name for himself. As if it needs to be said, I LOVE me some Artifacts. I'm normally a Panini guy, but I have the feeling that Upper Deck will be getting a lot of my collecting money for this set. I'm definitely going for the set, but I am going to get another couple of boxes together before I post a want list. 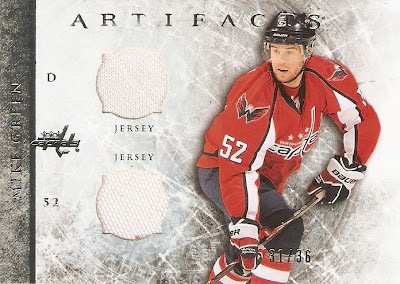 Since I wasn't able to jump full force into hockey collecting until earlier this year, I missed out on the big release of 2011-12 Upper Deck Artifacts. Now, sure, I could have purchased a box or two on line, but seeing as though I buy all my wax through my LCS, if he's out of the product, then I just move on to the next thing. This year, however, was different. I was ready to go, and although I had to wait until payday to acquire my Artifacts, I finally got my hands on two hobby boxes. Artifacts boasts a 100 card base set, featuring current and former players in both their regular-season uniforms and various all-star uniforms. The set continues on, though, with serial-numbered subsets to 999. 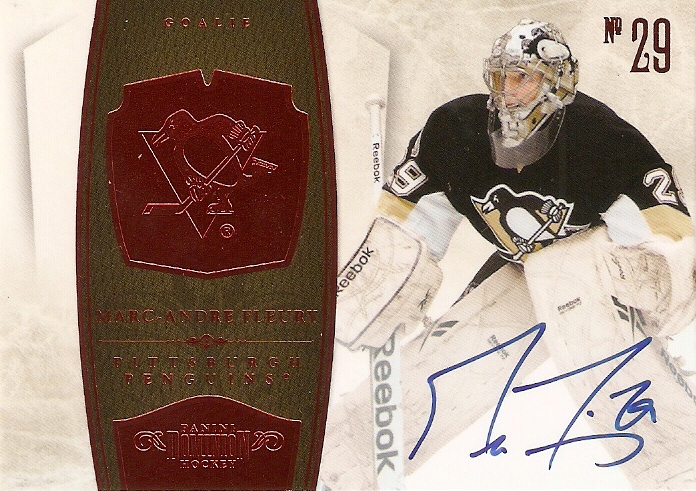 Cards 101-125 feature goaltenders and 126-150 features players in their Team Canada uniforms. Cards 151-198 are all rookie cards /999 and feature players who made their debut late last season or in the playoffs. Cards 199-240 are also rookies, but are done in redemption form. 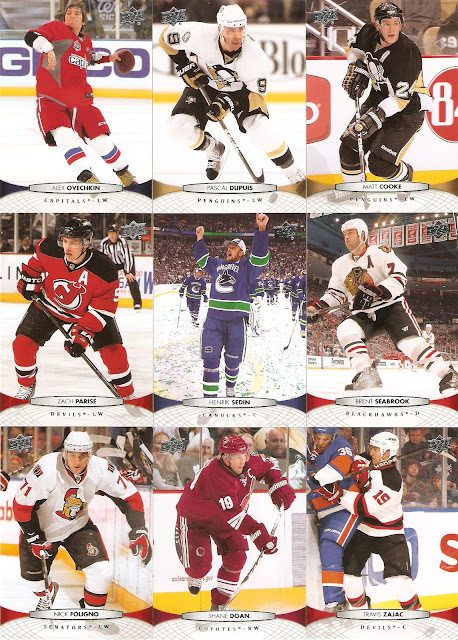 This way, they can release their product before the new crop of NHL rookies make their debut, but still include them in the set. More on that later. 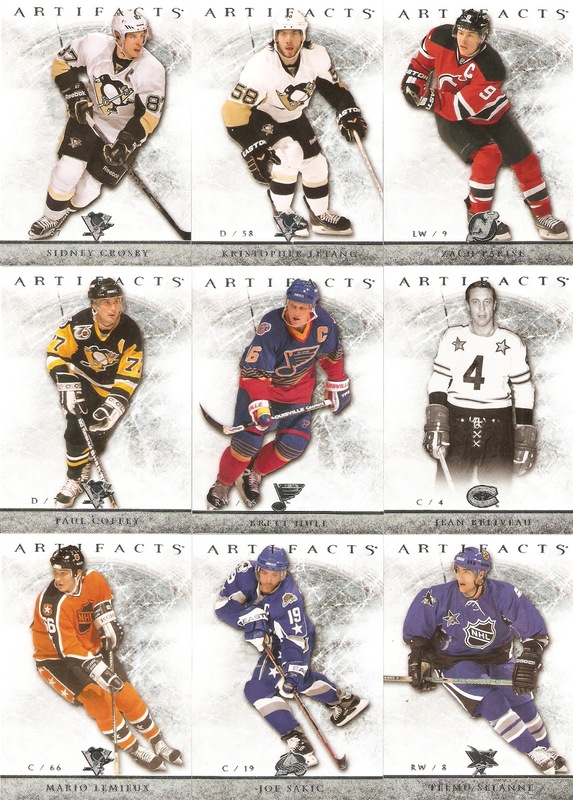 Typically, the 2012-13 Artifacts boxes will contain a total of four hits, with at lest one being an autographed card and one being a patch card. Either way, ALL relics from Artifacts contain two swatches, which I think is pretty cool. The hit of the box, for me, was a jersey/patch card, numbered 19/24 of Luc Robitaille. 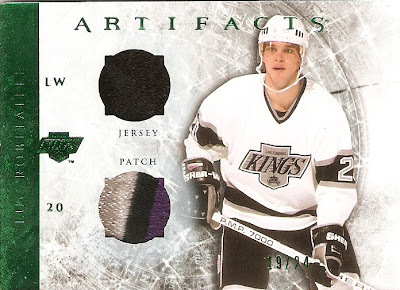 It contains a plain black jersey swatch, and a NICE patch that gives equal attention to the purple, black, and silver that Robitaille wore during his latter Kings days. The box also contained another rare serial-numbered relic card, a Mike Green dual jersey, numbered 31/36. The dual relic base parallels look just like the regular set, but they also have a much more rare horizontal design, which they serial number. Plus, they look WAY cooler. 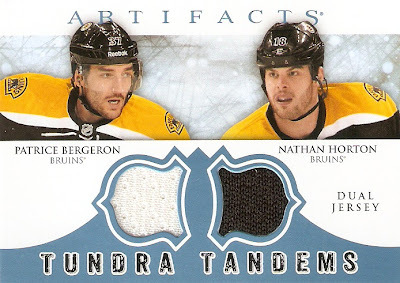 My only non-serial-numbered relic card out of this box was a dual jersey card of Patrice Bergeron and Nathan Horton of the Boston Bruins. 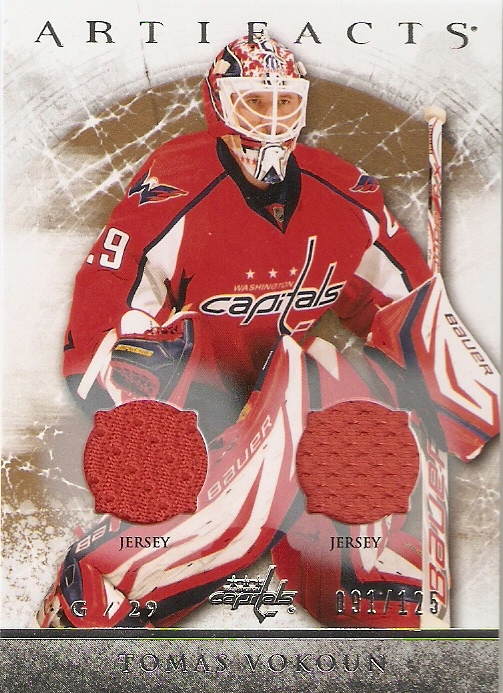 Unlike the Mike Green card, the two jersey swatches here are in two different colors, which looks so much better than the identical ones. 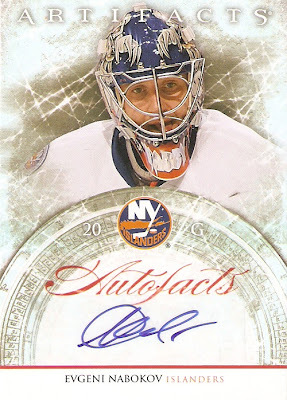 My one auto of the break was of New York Islanders goaltender Evgeni Nabokov. 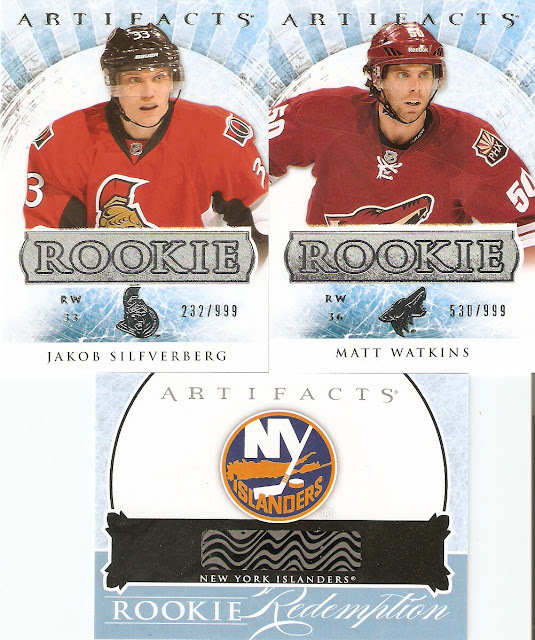 Artifacts has a five-tiered system for its autographed cards, and this Nabokov falls in "Tier D," which has it at an insertion rate of 1:59 packs. All things considered, I could have done worse. As can be expected from a product released before the season begins, most of the top rookies are not included. 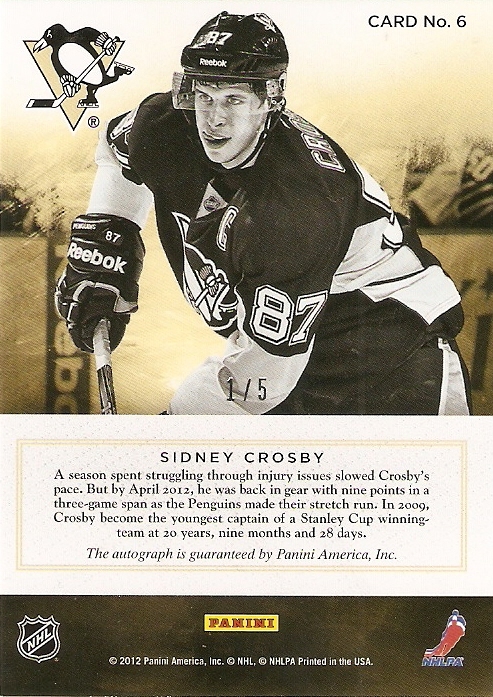 Due to licensing restrictions, companies cannot print a card of a player until he has appeared in an official NHL game. Upper Deck gets around this with their rookie redemption program. They produce a redemption card for each team's top rookie and 12 "wild" cards for teams with more than one. This way, they are able to include them in the set, but not have to produce the cards until players appear in a game. 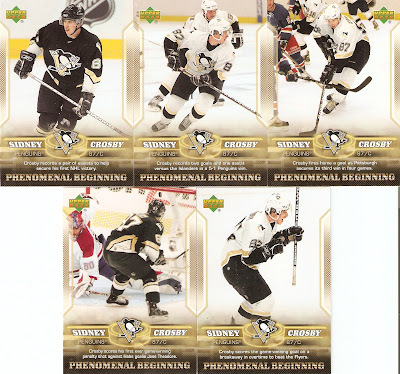 Each box appears to include two rookies and one redemption. 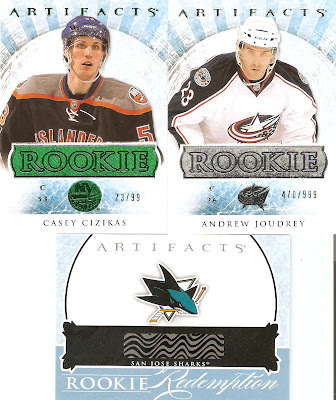 My two rookies were a Casey Cizikas emeral parallel numbered 73/99 and an Andrew Joudrey numbered 470/999. My redemption card was for the San Jose Sharks, so we'll just have to wait and see who that ends up being. Judging primarily from the two boxes I opened, each box also contains two cards from their /999 serial-numbered cards 101-150 and one low-numbered parallel. 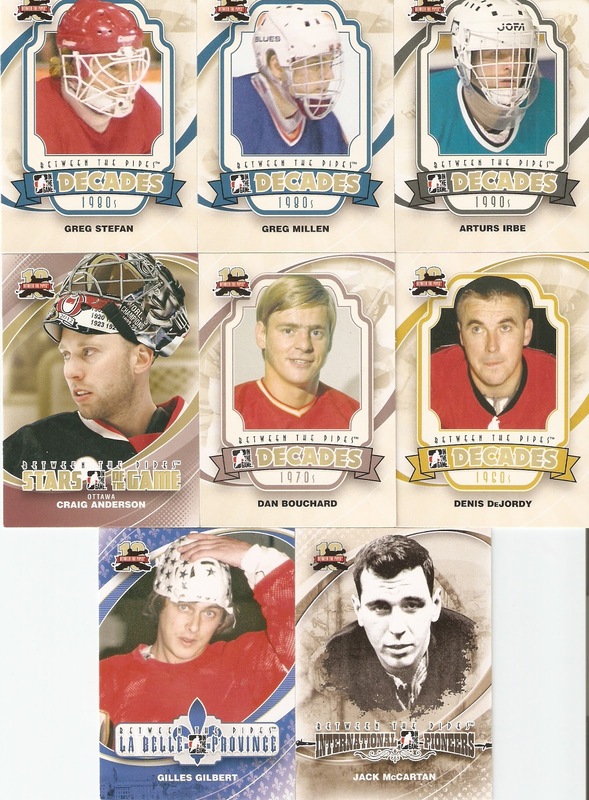 This box had Team Canada cards of Wayne Gretzky 116/999 and Ryan Getzlaf 960/999, as well as a Shea Weber sapphire parallel numbered 82/85. Well, there you have it for box #1. 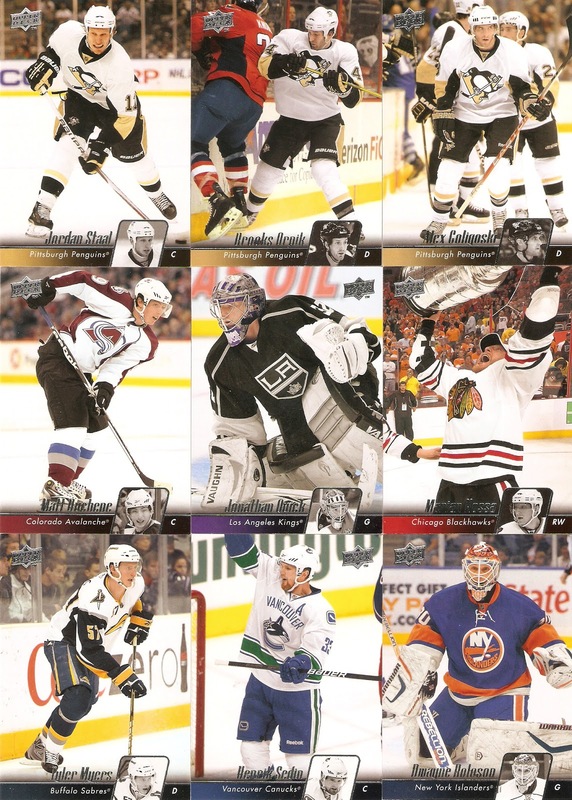 This looks to be a great set with some cool inserts and great hits. Stay tuned for the contents of box #2. With the end closing in, I picked up number 3 of 4 for my Penguins rookie collection of 2011-12 Dominion autographed patch cards, with a Joe Vitale, serial numbered 112/199. The autograph leaves much to be desired, as it appears to be a scribbled "Joe 46" (or maybe "Vitale 46"), but the patch is pretty cool. It looks like it comes from the team logo, with two lines of embroidered stitching and three colors (there's some gold just barely peeking out of the bottom right corner). Vitale was a rookie this year, but he was actually drafted in 2005 in the seventh round (195th overall), but continued on with his college career, playing four years at Northeastern University. In 2009, he signed a one-year entry-level contract with the team that drafted him four years earlier and spent the next three years with Wilkes-Barre Scranton of the AHL. Vitale made his NHL debut on February 10, 2011 against the Los Angeles Kings and scored his first NHL goal February 16, 2011 against Peter Budaj of the Colorado Avalanche. 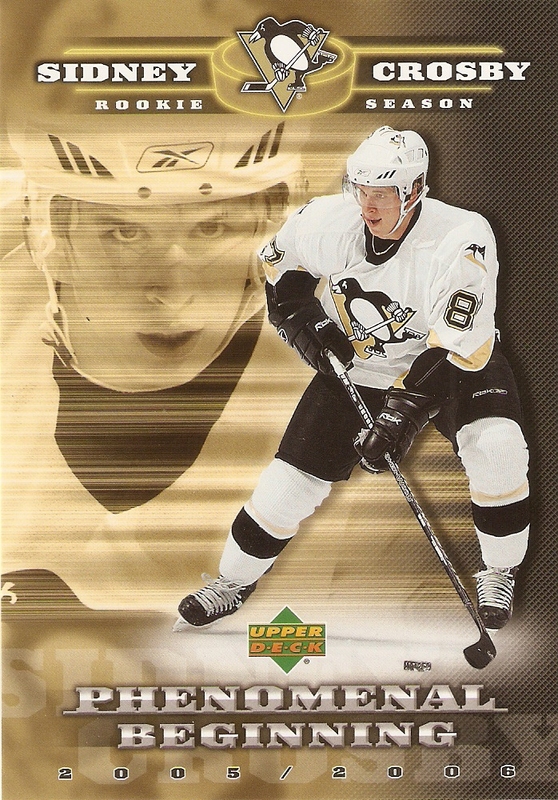 He only played in 9 NHL games that year, but the next season, he was on the roster full time, playing in 74 NHL games, scoring 4 goals and 10 assists. He signed a two-year contract extension earlier this year. 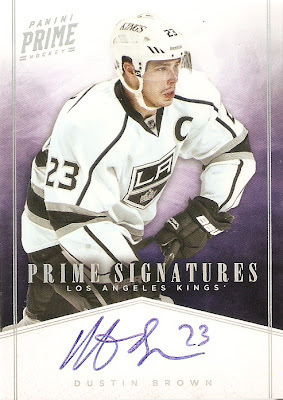 When Panini Prime was released last month, I went in with guns blazing. I bought into a case break, bought a few relics, and came away with a couple of redemptions. The big three cards for me were redemptions for Prime Signatures Silver Holo-Foil variations of Sidney Crosby and Mario Lemieux and a Prime Namesakes auto of Crosby. Luckily for me, both of these guys are getting their autos taken care of, and I know have in hand TWO of those three cards. The Silver Holo-Foil variations are the rarest of the Prime Signatures cards. Most are numbered to just 25 copies, but the Crosby is numbered to Just 5!!! I guess I must have been the first one to enter my redemption code, because I was sent card 1/5, which may not matter to most people, but I think it's pretty cool. The Mario Lemieux card is actually my first autograph of his. This one also has a cool serial number of 6/25. I suppose if it can't be 66, one 6 will do just fine. What I really appreciated, in addition to just getting the cards to begin with, is that they were both sent in magnetic snap-down cases, instead of just a penny sleeve and a top loader. It's a small thing, but I certainly appreciate them going the extra mile to ensure that these fantastic cards arrive in great condition. I am certainly happy that these redemptions have gotten filled and arrived in such great shape. Now I just have to wait for Crosby to send in those Prime Namesakes cards. All autographs are on-card, and they all look FANTASTIC! Trade From Blog Reader Douglas C.